Meanwhile, Israel observed this holiest of days as a nation; its citizens spent the day fasting and praying, not listening to the radio or reading newspapers. Many had no idea the attack had occurred until they gathered for Yom Kippur services later that evening. At synagogues throughout the country, rabbis read aloud the names of those being summoned immedi­ately to fight. In one crowded synagogue, a reservist soldier stood as his name was read, and as he turned to leave, his weeping father held him in a tight embrace, refusing to let him go. The rabbi intervened, saying, “His place is not here today.” The rabbi blessed the soldier as his father released him. The Yom Kippur War (or as some called it the October War) had begun. of that day affected the lives of all Americans, because of a devastating economic—not military — weapon. The Arab nations retaliated against the West with an oil embargo, dramatically raising the price of oil and reduc­ing the supply. It revealed a significant weakness of the United States, one that demonstrated how closely its economy was aligned with the accessi­bility of oil. Many believe this 1973 confrontation to be the genesis of the 1970s energy crisis. Although it played a major role, the crisis was actually rooted in earlier events. The New York Times first used of the term “energy crisis’” in relationship to the United States in 1971. In a three-part series titled “Nation’s Energy Crisis,” reporter John Noble Wilford recounted the effects of a Faustian bargain reaching back to the dawn of the Industrial Revolution. Dr. Faust, of German legend, was an astrologer and alchemist who sought forbidden knowledge and ultimately sold his soul to the devil. Mephistopheles, to attain it. The story has been used as a symbol for Western civilization’s constant pursuit of power and knowledge.’ Wilford used it to describe America’s situation in 1971. Symbolically, the 19 century’s bucolic envi­ronment was sacrificed for “modern man to command. . . and to harness in the Saturn 5 moon rocket the power of 900,000 horses.”  This energy – dependent society had struck the Faustian energy bargain, and. Wilford argued, it resulted in the energy crisis of the 1970s. Aside from the environmental damage wrought by industrial society, there was also the problem of how to sustain its momentum. The power to drive modern American society is derived in large part from natural resources not within its control. At the time of Wilford’s article, petroleum represented 43 percent of all domestic energy usage. With more than 90 percent of all the oil consumed in the eastern half of the United States com­ing from sources abroad. Wilford argued. “This gives a number of foreign governments a major voice in the price and How of American fuel.” And more than prices were under their control. As one geologist wrote in 1976, “Whoever controls the energy systems can dominate the society.” As the United States became a superpower in the 20th century, the American engine became increasingly powered by a fuel not of its own making. The effects of external control became evident with the onset of the Arab oil embargo. In 1973. 2 years after the suggestion that the United States was suf­fering from or had an energy crisis, the Arab world began using “oil as a weapon.”   The statistical results of the Yom Kippur War included the loss of more than 3,000 lives, as well as billions of dollars expended in military equipment. But for the first time, a new weapon emerged that had the power to destabilize all industrial nations —oil. Because of American support of Israel, Saudi Arabia announced a 10-percent reduction in the flow of oil to the United States and its allies, with the threat of an additional 5-per­cent reduction each month unless the West stopped sending arms to Israel. Saudi Arabia was at the time producing 8!^ million barrels of oil a day. and it represented the third largest oil exporter to America, roughly 400.000 barrels per day. * Similar threats came from other members of the oil cartel, known as the Organization of the Petroleum Exporting Countries (OPEC). Oil was the lifeblood of the United States, and a shortage or a threat to its access quickly revealed it to be the Nation’s Achilles’ heel. The price of a barrel of oil in the past year alone had increased 450 percent, from $2.59 to $11.65. The price of a gallon of gasoline increased from 38.5 cents in May 1973 to 55.1 cents in June 1974. There seemed to be only one immediate answer to the problem—conservation. 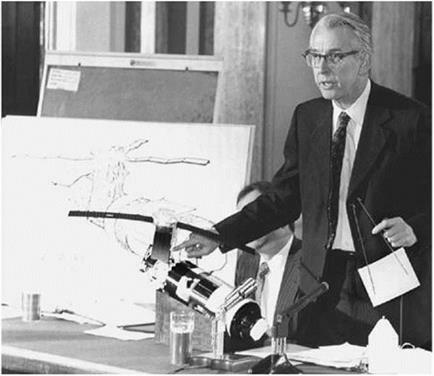 Many oil industry experts thought that the United States could “get by without the Arab oil imports primarily by reducing American consumption.” As early as 1973, vocal proponents called for “strong conversation measures,” including new technologies, which would reduce America’s energy dependence and lessen the effectiveness of the Arabnations’ oil weapon in ’“political and economic warfare”  A conser­vation strategy became the primary means to counter the effects of the energy crisis. Despite the urgency, it would be nearly 2 years after the oil embargo before American politicians began to pursue actively a solution to the problem. the crisis. On January 31,1975. a New York Times reporter wrote that “the country may well be hastened into action.” That same day, most likely unknown to the press, to Bethe, or even to President Ford, two promi­nent U. S. Senators—Frank E. Moss, a Democratic Senator from Utah, and Barry Goldwater, a Republican Senator from Arizona—sent a letter to the NASA’s Administrator, James C. Fletcher. They thought the Government Agency that had most recently held the Nation’s attention with its suc­cesses on the surface of the Moon might have the technological capability to coordinate a major conservation initiative on Earth. This letter, dated January 31, 1975. was the genesis of what became one of the largest coor­dinated environmental programs ever attempted in the United States. NASA refocused its sights from the heavens to Earth. One of the practical earthly problems that entered NASA’s new aero­nautical consciousness was the energy crisis. The crisis threatened to shake the foundations of commercial flight. Prior to 1972, fuel represented one – quarter of the operating costs of a typical airline organization. After 1972, foreign petroleum dependency increased, and fuel doubled its revenue drain, resulting in the reduction of flights, grounding of aircraft, and layoffs of thousands employees.2-‘ The situation appeared to grow1 worse by the day. In the letter. Moss and Goldwater said it was their desire, as leaders of the Committee on Aeronautical and Space Sciences, that NASA devise a plan to develop new technologies to lessen the effects of the energy crisis. The plan was needed for the “preservation of the role of the United States as a leader in aeronautical science and technology” They envi­sioned a program led by NASA that would result in significant tech­nology transfers to industry. NASA was to research a new generation of fuel-efficient aircraft that would cost roughly the same as current aircraft, have the same performance capabilities, meet the same safety and environmental requirements, offer significant fuel savings, and be able to take to the skies in the 1980s. Moss and Goldwater ended their letter by stating, “It is our hope that the goal you establish will be one that is both feasible and challenging.”25 Risk and the acceptance of challenge were approved and encouraged components of the daring project from the start. The result was a significant cruise performance improvement and an increase in fuel efficiency. In mid-1970. NASA established the Advanced Transport Technology office to take advantage of the aerodynamic poten­tial of the supercritical wing for flight efficiency. Other fuel-efficient tech­nology programs were soon added. 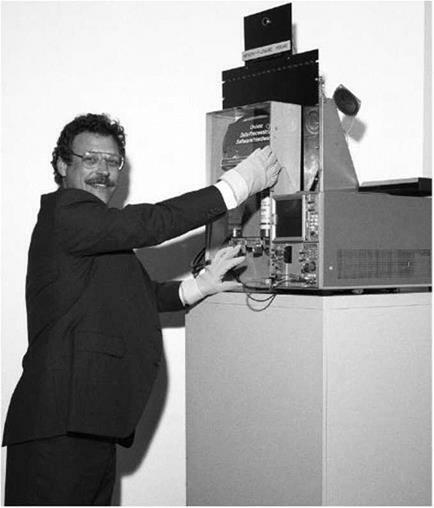 This included an Active Controls pro­gram. which used computers to control airplane surfaces to reduce drag and increase efficiency. Composite materials were also studied because of the light weight and strength of polymers compared with existing alumi­num and metal airplane components. NASA’s Administrator, James Fletcher, assigned overall responsibil­ity for a new airline fuel efficiency program to Alan M. Lovelace, NASA’s Associate Administrator for Aeronautics and Space Technology. (OAST), directed the 15-member task force, which came to be called the Kramer Committee.-‘4 For the next 2 months, the Committee members worked together to develop a technology plan to satisfy the Government’s request. To evaluate their results, NASA on April 17 established an advi­sory board chaired by Raymond L. Bisplinghoff from the University of Missouri. The Kramer Committee included a remarkably diverse and knowledgeable group of members representing universities (MIT), industry (American Airlines, Pan American, Douglas Aircraft. Boeing), Government (NASA, the Federal Aviation Administration fFAAJ, the Department of Transportation, the Department of Defense), and engine manufacturers (Pratt & Whitney, Lockheed, General Electric). They named the new conservation effort the Aircraft Energy Efficiency (ACEE) program. In May and June 1975. the advisory board met to review and revise the initial recommendations of the Kramer Committee. The group members initially started with a long list of initiatives that would potentially lessen the effects of the energy crisis. They then worked to reduce the options to a manageable number and divided them into specific technology sections. Although some projects might be ready for short-term implementation, most required a projected 10 years of research and development before aircraft fuel consumption would be reduced. The ultimate goal, according to Kramer, was “achieving a technology readiness by 1985 for a 50 per­cent reduction in fuel consumption for new civil transports.”1- There were two unbreakable ground rules for attaining these goals. The first wras that fuel would not be saved at the expense of the environment. The second wfas that fuel savings techniques would not compromise aircraft safety in any way. Ultimately, the Kramer Committee identified six technology plans it believed would achieve the stated fuel reduction goal, without violating safety or environmental criteria. The Kramer Committee’s six conservation technologies addressed the three ways to improve fuel efficiency in an airplane, as expressed in the Breguet range equation: decreasing the fuel consumption by an engine, decreasing the aircraft drag by improving its aerodynamics, and decreas­ing the weight of the airplane. The Committee’s six conservation technolo­gies addressed all of these areas. The Engine Component Improvement project would identify minor ways to improve existing engines to make them more fuel efficient. At an estimated cost of S40 million, the cumula­tive effects could have a 5-percent increase in fuel savings. The Energy Efficient Engine (or “E3,’’ as it came to be known) project would go beyond modifications to existing engines by creating an entirely new’ model to be ready for airplanes built in 1990. This was a planned 7-year, $175- million project, with a potential 10-percent fuel savings. The final propul­sion project was considered the most radical of the all, a return to propel­lers, or “turboprops.” Though the riskiest proposal in terms of success, it also provided one of the greatest rewards, a potential 15- to 30-percent fuel savings compared with existing jet aircraft. The turboprops w’ere a 9-year, $ 125-million program. Janies Kramer. Associate Administrator for Aeronautics, visiting Langley in 1978. 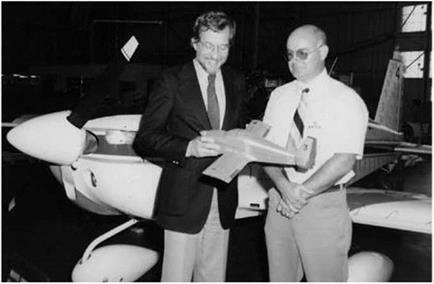 Joseph Chambers, at right, briefs him on stall/spin research for general aviation airplanes. Kramer is holding a spin tunnel model of the American Yankee airplane shown in tlie background. Courtesy of Joseph Chambers. The first, the Energy Efficient Transport program, called for evolu­tionary improvements to optimize aircraft designs. Wind tunnel studies would help verify new designs that decreased drag and improved fuel effi­ciency. This was a 7-year, S50-million program, with estimated fuel sav­ings of 10 to 15 percent. A second aerodynamics initiative. Laminar Flow Control, had an even greater potential drag reduction potential through a smooth (or laminar) flow over the wings and tail. Virtually all civil trans­ports cruise with a turbulent flow that increases drag. With anywhere from 20 to 40 percent fuel savings, the 10-year, $ 100-million program was esti­mated to be flight-ready by 1990. The final area the Kramer Committee identified involved using advanced materials to reduce the weight of aircraft. The Composite Pri­mary Aircraft Structures program investigated composites containing boron or graphite filaments in polyimide, epoxy, or aluminum matrices that could potentially reduce aircraft weight by 25 percent. This was a $180-million, 8-year program with 10- to 15-percent fuel savings poten­tial, with the new composite designs in service by 1985. There were some concerns about the selection of these ACEE proj­ects. 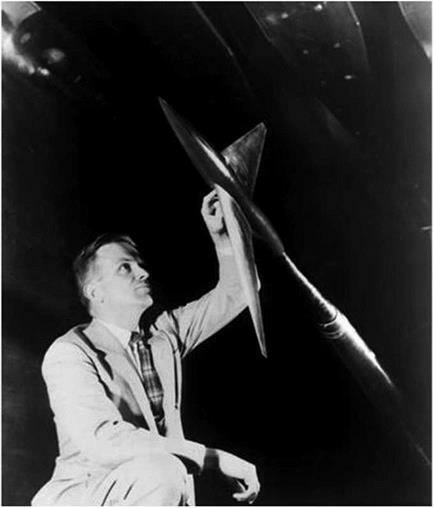 Hans Mark, the Director of NASA’s Ames Research Center, wrote to Alan Lovelace in June 1975 saying that “Certainly there are many other aeronautical needs which must not be neglected.”3-‘ He understood that fuel conservation was in the national interest, but he cautioned against committing too much aeronautical funding to the development of civil aviation at the expense of military aircraft technology. He added that aero­nautical priorities change quickly. The main issue in 1968 was airport con­gestion. In 1970. aircraft noise was the central problem. By 1974, it was fuel conservation. Mark wanted to ensure that NASA did not overreact to something that might turn out to be a short-term problem. Furthermore, he suggested that fuel efficiency could be improved by working with the airlines to develop more fuel-efficient flight trajectories. 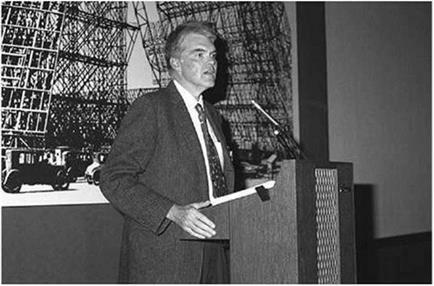 The role of NASA itself was the one of the final areas of debate by the Kramer Committee. Since the Committee was made up of a cross sec­tion of individuals from different academic, industrial, and governmental organizations, there was a broad and vigorous discussion about NASA and the importance of Government-funded research. 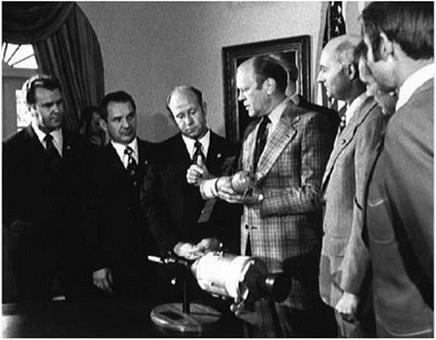 The Committee members realized that ACEE was unusual because it “in some instances goes fur­ther in the demonstration of civil technology improvements than has been NASA’s traditional role.” But the consensus was that this was necessary because of the “inability of industry to support these activities on their own.” Specifically, the Kramer Committee stated, individual technolo­gies such as the turboprop or laminar How control would likely never be developed by industry because of their “high technical risks.”* The Committee published its final report. “Aircraft Fuel Conservation Technology,” in September 1975. The engineers had finished defining and laying out the program. The only other question to be answered was: Would Government approve the program and provide the funding for one of the largest coordinated fuel conservation projects ever attempted in the United States? To answer that question, the Senate held three hearings in fall 1975 and used the testimony to decide the program’s future.